The MiG-3 was certainly not successful as its designers hoped it would be. But lucky for MiG OKB (OKB is a transliteration of the Russian acronym for "Опытное конструкторское бюро" - Opytnoe Konstructorskoe Byuro, meaning Experimental Design Bureau), the world was moving to a new era of fighter airplane design, the era of the jet fighter. One year before the MiG-3 retired, Germany and Britain had already introduced jet fighters to the European theater (You can check my forum post “The first operational jet fighters”). It was about time for the Soviet Union to start investing in this new type of aircraft so as to prevent another Operation Barbarossa from occurring again. It is interesting to note that in 1931, Soviet dictator Josef Stalin said: "We are fifty or a hundred years behind the advanced countries. We must make good this distance in ten years. Either we do it, or they will crush us." Stalin said these words at the beginning of the rapid industrialization campaign. Ten years later, Nazi Germany invaded the Soviet Union. 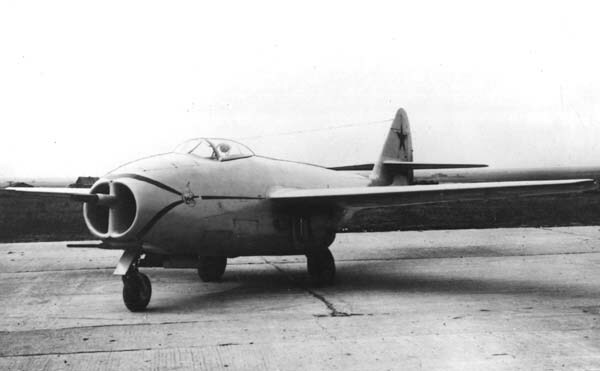 In February 1945, the Council of People's Commissars ordered the MiG OKB to develop a single-seat jet fighter to be equipped with two German BMW 003 engines. Intended as to destroy bombers, the aircraft was to be equipped with a single 57-millimeter (2.2 in) or 37-millimeter (1.5 in) gun, plus two 23-millimeter (0.9 in) guns. A more detailed directive was issued on 9 April setting out requirements that the aircraft should have a maximum speed of 900 kilometers per hour (559 mph) at sea level and a speed of 910 km/h (565 mph) at an altitude of 5,000 meters (16,400 ft). It should be able to climb to that altitude in four minutes or less and it should have a maximum range of 820 kilometers (510 mi). Three prototypes were ordered to be ready for flight tests by 15 March 1946. The OKB chose a "pod-and-boom" layout for their new fighter, the I-300 (also called the izdeliye F (model or product F) by the OKB) because it offered the advantages of improved landing performance and better visibility from the cockpit when landing, but it had some drawbacks like the unfamiliar tricycle arrangement of the landing gear, protecting the rear fuselage from the jet exhaust, and where to place the aircraft's armament. The all-metal aircraft had unswept, mid-mounted wings with two prominent air intakes in the nose. Its two-spar wings were fitted with slotted flaps and Frise ailerons. Its powerplant comprised two RD-20 turbojets, which were Soviet-manufactured versions of the BMW 003. The two engines were located behind the cockpit in the lower fuselage, with the exhaust exiting under the tail unit. A steel laminate heatshield was installed on the bottom of the rear fuselage for protection from the exhaust gasses. There were four bag-type fuel tanks in the fuselage and three in each wing, providing a total internal fuel capacity of 1,625 liters (429 US gallons). The cockpit was not pressurized and the planned armament consisted of a 57 mm NL-57 cannon mounted in the centerline engine intake bulkhead and two 23 mm Nudelman-Suranov NS-23 autocannon mounted on the lower lip of the air intakes. The N-57 gun was provided with 28 rounds and the two NS-23 cannon had 80 rounds each. Construction of the three prototypes began in late 1945 and the first prototype began manufacturer's testing on 30 December. The ground testing revealed that the engine exhaust caused a low-pressure area under the rear fuselage which caused the fighter to tilt tail-down during engine tests. The rigidly mounted heatshield caused the underside of the rear fuselage to deform because the steel and the duralumin skin of the fuselage had different expansion ratios when heated. The rear fuselage and the heatshield were both redesigned to eliminate these problems. On 23 March the prototype was trucked to the Flight Research Institute (LII)'s airfield at Ramenskoye to begin preparations for flight testing. On April 24th 1946, Mikoyan-Gurevich and the Yakovlev OKB tossed a coin to determine which aircraft would be the first Soviet jet to fly. MiG won and the I-300's first flight lasted six minutes. Yakovlev flew second with their jet fighter the Yak-15, which was a jet fighter version of their famous Yak-3. Early flights of the I-300 revealed problems with the stability of the aircraft and vibration problems with the new articulated heatshield. It was stiffened before the twelfth flight, but that only partially cured the problem. The first aircraft crashed, killing the pilot, during a demonstration in front of high-ranking officials on 11 July when the attachment lugs of the wing leading edge fairings failed and they hit the horizontal stabilizers. The remaining two prototypes began flight testing the following month, but preparations for the 7 November parade commemorating the October Revolution delayed the start of the State acceptance trials until 17 December. Meanwhile, the horizontal stabilizer of the second prototype disintegrated during flight, but the pilot was able to land the aircraft safely. Another such incident happened to the third prototype in February 1947 and forced the tail to be reinforced. The aircraft was given the service designation of MiG-9 and a small batch of ten aircraft, equipped with original German engines, was ordered during 1946 from Factory No. 1 in Kazan before flight testing was completed. They were intended to be used in the parade, but bad weather forced the cancellation of their flypast. Two of them were assigned to participate in the state acceptance trials while others were used as testbeds for various programs. The trials were concluded in June and the MiG-9 generally met the performance goals set by the Council of People's Commissars. The test pilots found the fighter easy and simple to fly. Defects noted during testing were that the engines flamed out when firing the cannon at high altitudes due to gun gas ingestion, no ejection seat was fitted, nor were air brakes or a fire suppression system. The fuel tanks were not self-sealing and no armor was provided for the pilot. Despite these drawbacks, the MiG-9 was ordered into production at Factory No. 1 before the acceptance tests were completed as the Soviet leadership believed that its shortcomings could be rectified during production. A batch of 50 aircraft, 40 single-seat fighters and 10 two-seat trainers, was ordered in late 1946 to participate in the 1947 May Day parade. In recognition of their accomplishment Artem Mikoyan and Mikhail Gurevich were awarded the Stalin Prize in 1947. The two-seat trainer had the internal OKB designations of I-301T and izdeliye FT and the first prototype was converted from one of the "parade" aircraft during 1946. Its fuel capacity had to be reduced by one third to make room for the second tandem cockpit. Dual controls were fitted as was an intercom to allow the instructor and student to communicate in the air. Each man had an ejection seat designed after that used by the Germans in their Heinkel He 162 fighter. This aircraft was delivered on 17 January 1947, although flight testing was not completed until 5 April. The ejection seats were not tested in the air, but they required extensive testing on the ground to ensure the proper operation of the seat. State acceptance trials were not completed until 2 June and the aircraft was rejected because of the poor visibility from the rear cockpit. A second aircraft was completed on 15 July and the visibility from the rear cockpit was improved by replacing the original bulletproof windscreen with a larger glass plate, reshaping the canopy's side panels, and removing a partition between the cockpits. This aircraft was fitted with air brakes in the wings and two 260-litre (57 imp gal; 69 US gal) drop tanks hung under its wingtips. It passed its state acceptance trials later in 1947 and was recommended for production with the service designation of UTI MiG-9. The ejection seats were extensively tested during 1948 and approved for use, but by this time the aircraft was deemed obsolete and there was no point in building a training version. A total of 610 aircraft were built, including prototypes, and they entered service in 1948 with the Soviet Air Forces. The aircraft got several engine replacements and was used as a test bed for trying new inventions such as the ejection seat, after burning engines, pressurized cockpits and airborne radar. 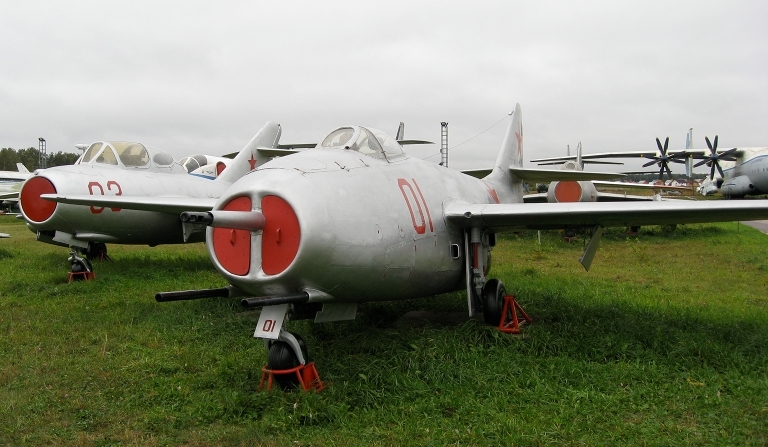 The MiG-9 saw a very short service life as it was produced only from 1946-1948. This was the case with most “first operational jet fighters”. Aircraft designers were only beginning to understand jet powered aircraft along with their defects and performance. The MiG-9 was quickly to be replaced by the MiG-15 Fagot, which is considered to be MiG’s true entry to the fighter aircraft world. In 1950, at least 372 were transferred to the People's Liberation Army Air Force to defend Chinese cities against air raids by the Nationalist Chinese and train the Chinese pilots in jet operations. Only three are known to survive. Regarding diecast models, I own a De Agostini 1:100 model of the MiG-9. I got this one from Russia so the model’s label is written in Cyrillic. just read the article. didn't know much about the MiG-9 I thought the MiG-15 was their first. nice article. Many people do not know anything existed before the MiG-15. The MiG-3 and MiG-9 saw very little combat and were operational for very few years (the MiG-9 was only operational for 2 years). Unlike the MiG-15 which appeared very surprisingly in the Korean war and amazed the west with its characteristics and performance. Let me also add that there was nothing really special about the MiG-3 or the MiG-9. The MiG-15 was the most widely produced jet in history and had a very interesting story related to the purchase (later reverse engineering) of its engines. Do you remember where you got these images from? The reason I ask is that I'd like to use the fourth image (the MiG-9 with the pilot leaning on the port wing) in a museum display. However, to do so, I would need a higher resolution image and copyright clearance to use it. I would be extremely grateful for any help you might be able to give me in tracknig down the photo and getting permission to use it. Perhaps you can contact them and check if you can use that in a museum display or not. Thanks, and I appreciate your speedy response. I'll certainly give them a try and see how I get on. Thanks again for the link.